Preventing dog ear infections is easier than treating them, and it can save your pet a lot of misery. If you see the signs and symptoms your dog may have infected ears, don't delay in bringing him to the veterinarian before the problem worsens. Why Are Dog Ear Infections So Common? The canine ear may be one of the most wondrous hearing devices ever designed, but that same design also makes it the perfect environment for spawning dog ear infections. The main problem seems to be with the structure of the ear canal itself. The canal begins at the opening of a dog's ear and takes an almost straight vertical drop, followed by a hard right angle that leads to the eardrum. Once moisture makes its way into the canal, it has a difficult time drying out. Couple this with the fact that many breeds have quite a bit of hair growing in the opening region of the canal, and you get exactly the kind of dark, warm, moist environment where bacteria thrives. Dogs with long, floppy ears like Beagles and Irish Setters are at higher risk for infections because their ear shape helps foster a bacteria-friendly environment. As the bacteria population increases, pus painfully builds up within the canal. This is hard enough on your pet when only one ear is infected, but it's possible to have an infection in both ears, increasing your pet's misery. 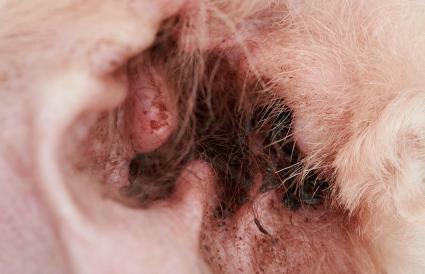 Veterinarians define dog ear infections by the depth they occur within the ear. In general, the deeper the infection lies, the more severe it becomes because it is harder to reach for treatment. Otitis externa is the term used for infections located in the outer ear canal. Otitis media defines dog ear infections in the middle ear region. Otitis interna pertains to infections of the inner ear. Reading your dog's body language will give you clues about how he's feeling. If you notice one or more of the following signs, it's time to pay your veterinarian a visit. Your dog paws at his ears a lot. He may also rub his head and ears against the ground, furniture, and anywhere else he thinks might bring some relief. Some dogs shake their heads quite a bit. The ear flaps may become red and somewhat swollen. The skin may also become broken and bleed if the dog scratches at it too hard. The inside of the ear seems exceptionally moist and may contain brown material that looks similar to coffee grounds. You may notice a foul smell coming from your pet's ears. Your pet may hold his head tilted to one side, and his overall balance may be affected if the infection becomes severe. Yeast and bacteria are two of the primary culprits for infections in your dog's ears. The symptoms appear just about the same. The major difference between the two is in scope. A yeast infection can not only fester in your dog's ears but move to other parts of the body. Yeast infections also have the risk of developing secondary bacterial infections which makes them a bit harder to treat. Head shaking and rubbing sometimes causes a blood vessel in a dog's ears to burst. The blood that collects in the flap then develops into an aural hematoma, which is a type of blood clot. Minor clots may be left to heal on their own but larger ones may need to be surgically removed, and both processes may leave scars on the affected flap. Bleeding can also occur in the ears when a dog scratches at them because of the pain and skin breaks open. If your dog has a yeast infection, doing this can lead to a secondary bacterial infection because of the open wounds. Treating dog ear infections is a multi-step process that needs to be done in conjunction with a qualified veterinarian. The canal of the infected ear must first be thoroughly cleaned before anything else can be done. This can include swabbing the canal, removing hair and other debris, and may even require flushing the canal out in order to remove excess waste and pus. Since dog ear infections are quite painful to your pet, it's usually best to let your vet take care of this as part of an office call. 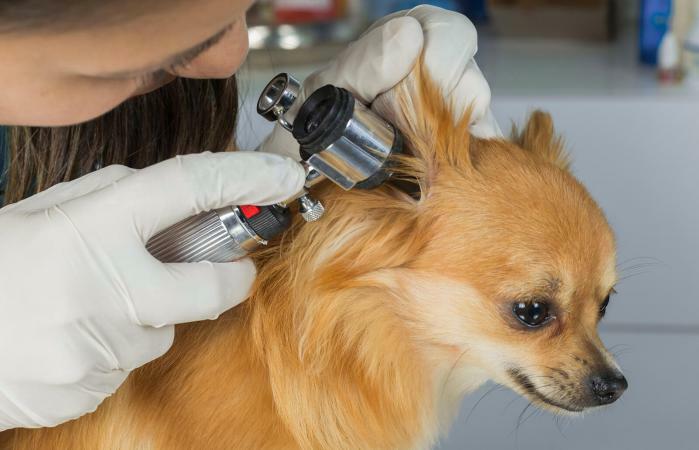 Once the ear is as clean as possible, your vet will examine it to determine just how severe the infection is, and decide the best way to proceed with treatment. In most cases, pet medication such as Panalog will be administered directly into the ear to treat the inner irritation that is causing so much discomfort. This treatment will be followed up with either an antibiotic injection or a course of oral antibiotics that you can give your pet at home. The average case of an ear infection can take from 10 days to about a month to clear up although more severe cases can take longer. In the most severe cases, surgery may be required to open the canal for cleaning and treatment because scar tissue can make the area unreachable. There are many suggested remedies for dealing with a dog's ear infections on the internet, such as using hydrogen peroxide, vinegar or oil. Ear infections are painful for a dog and can easily become serious without proper treatment. If you suspect your dog has an ear infection, bringing him to your veterinarian is the safest course of treatment and the one most likely to bring him the fastest relief. Never use any remedies at home or even over-the-counter medications and cleaners without discussing with your veterinarian first. Not only can these be detrimental if used incorrectly, but your dog could also be suffering from ear mites and without a diagnosis from the vet, you could end up treating the wrong condition with a substance that will have no effect or even make it worse. Unfortunately, no matter how diligent an owner is about ear cleanings and medication, some dogs are prone to relapses and medication seems to have no effect. Cases like this are referred to as "chronic," and there are two common options for treatment. Your vet may choose to take a culture of the fluid in your pet's ears in order to diagnose and treat the exact organism causing the infection. Surgical removal of the affected ear canal may become necessary to eliminate the source of the infections if treatment with medications doesn't work. Ear mites can easily take up residence in your dog's ears, and the symptoms of an infestation can be similar to those of an ear infection. In cases like this, your vet will still thoroughly clean out your dog's ears and then treat them with mite medication to kill the current population. Be prepared to continue the treatment at home for seven to ten days to make sure there are no recurrences. As always, the best way to head off ear infections and mite infestations is to pay attention to the condition of your pet's ears. When you're familiar with the way your dog's ears look when they're healthy, you'll find it easier to notice unfavorable changes early on. Weekly ear cleanings will help keep the canals free from debris and increase the amount of air flow to make the area less hospitable for opportunistic organisms.